How to remove RAVMON Virus from your PC ? Show hidden files and folders not working ? Computer shuts down automatically ? Is your right click context menu showing some Chinese scripts ? Is your show hidden files and folders not working ? Is your command prompt , Registry Editor and task manager disabled ?? If all these things are happening to your Computer , the reason is that it has got infected by a virus named " RAVMON " .What can this Virus do ?? Disables task manager , Registry Editor and Command prompt . Right click menu shows some Chinese scripts as shown in the figure. Computer shutdown automatically and slogs a lot. Show hidden files and folders Option won't work. With all these things not working , I can understand what can go with you !! I saw this thing on my friends PC . Then only I decided to write the solution for this.So how are you going to remove this ? One of my friend has developed a solution to kill this Virus.Download it and remove the Virus. One you download the tool , install it.Click on the three of them.and press OK.If you are not infected with RAVMON then the tool automatically shows the error message.So download it and enjoy using your PC. Thanks for this good information. I found this kind of situation one of my friends computer. Now i am going to solve the problem. THis tool not works for me, Show hidden files and folders not working, i change registry setting i tryed RAVMON removal, i done with PRT removal. still not works any solutions..
i did it i follow as the instructions hear given but not works i googled lot same solution cleaned with anitivirus also not works.. i done a simple trick with the key..
2. I followed these steps with little change. b. Type “regedit” and click “Ok”. d. Look at the “CheckedValue” key… This should be a DWORD key. If it isn’t, delete the key. e. Create a new key called “CheckedValue” as a DWORD (hexadecimal) with a value of 1. "No Fate, All that we makes"
Great its working properly. My hearty thanks to you Indianwala. Great. I am impressed. Thanks its a very nice tool it worked and also the registry edit to enable hidden files also great and worked Thanks again for all the help. Still the wireless in not searching the wireless networks in range. If any solution kindly let me know. Dear All, I tried same procedure above, it wouldn't work. The checkedValue number changed to 1 did not register. Pls help. That's great indiawala its working. we can change regisrty. bt virus change it again.so we need to remove virus! smart virus remover worked for me.. tnx alot..
A computer virus is malicious software designed to spread to other computers by inserting herself into legitimate programs called "guests." It can more or less seriously damage the functions of the infected computer. It can spread through any medium of exchange of digital data such as computer networks and CD-ROMs, USB keys, etc. 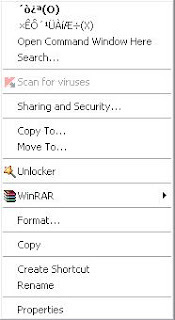 Thanks for the great Ravmon virus removal guide, if you're looking for some other solution how to remove other malware from your PC visit http://removalbits.com/how-to-remove-ask-toolbar-from-your-browser-removal-guide/ there are a lot of guides which I'm sure will help you to remove any malware from your PC, hope it will be useful for you.